Aesthetics is an integral part of periodontal practice. The clinician has to, not only address the biological and functional periodontal problems, but also deliver therapy with acceptable aesthetics. Of all mucogingival defects, gingival recession in the anterior, visible teeth is the commonest and most challenging clinical scenario to treat. Mucogingival surgery includes all periodontal surgical procedures designed to correct defects in the morphology, position and/or amount of gingiva surrounding the teeth. Among the mucogingival procedures, free gingival graft is a versatile modality of treatment for gingival recession and still remains a gold standard. Areas of gingival recession, in the absence of a mucogingival problem, in which there is an aesthetic or root sensitivity consideration, can also be treated with a free gingival graft. Gingival blood flow can be measured by the invasive and non-invasive methods. The former include vital microscopy of gingival margin, implantation of microspheres into the internal carotid artery in animals, infused radio isotopes and radio labeled microspheres and high speed cinematography. 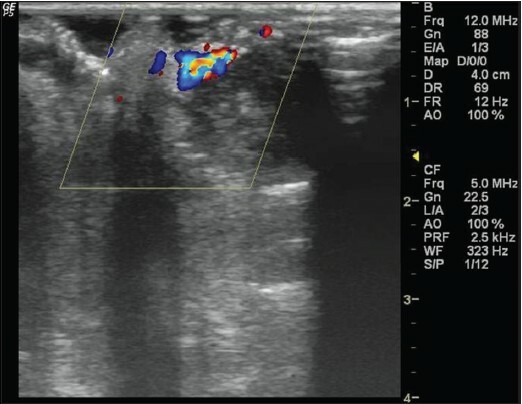 Doppler sonography is a non-invasive, accurate and simple technique to measure continuous microcirculatory blood flow in many tissues. It works on "Doppler Shift" principle-, measuring the frequency change that light undergoes when reflected by moving objects, such as red blood cells (RBC). It has been extensively used in various medical clinical applications, also in the field of plastic surgery to monitor blood perfusion in skin transplants and flaps. 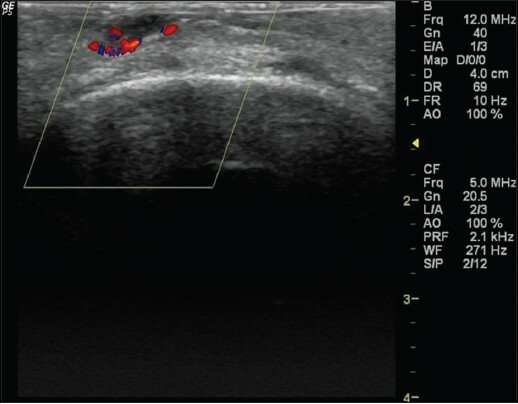 The purpose of this case report was to compare the gingival blood flow during healing of free gingival graft with and without adjunctive low level laser therapy using ultrasound doppler flowmetry and also to evaluate the pain perception following both the procedures. Two systemically healthy patients (Case 1: 24 year old male; Case 2: 28 year old female) with Miller's grade II recession on 33 and 41, respectively, attending our outpatient clinic, were selected for the study [Figure 1] and [Figure 2]. The treatment plan was discussed, verbal and written consent was obtained from both the patients. They received scaling and root planing 1 week prior to the surgical procedure. The direct technique of free gingival graft proposed by Miller  was performed. After administration of local anesthesia, root planing and flattening of the root surface was done. Root conditioning with tetracycline HCl for 1 min was performed. 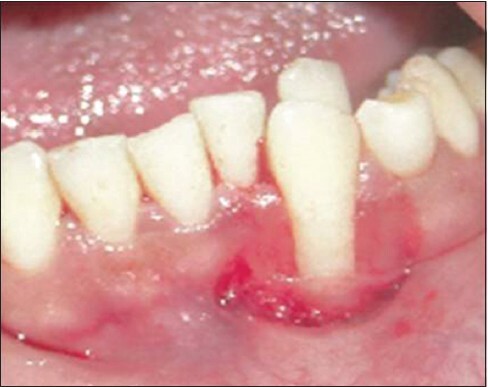 The recipient bed was prepared with two horizontal incisions on interdental papillae adjacent to the recession. These horizontal incisions at the distal end connected the vertical incisions on either side of the recession. A split thickness flap was elevated and dissected, being careful not to expose the bone at the apical end. A tin foil was used as a template, and gingival graft was harvested for the palate following adequate anesthesia. 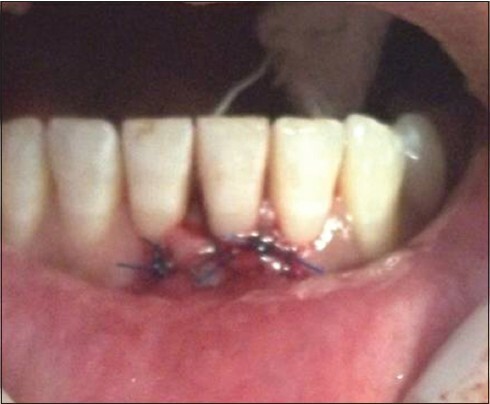 The graft was secured at the recipient site with 5-0 silk interrupted sutures and covered with a periodontal dressing [Figure 3]. Low level laser therapy was administered to case 2, on the first day half hour following surgery, then the third day, seventh day, and lastly on the ninth day. An 830 nm Diode laser [Figure 4] was used (Picasso, AMD LASERS TM , LLC, A Dentsply International Company, Tulsa OK). The laser was fired in the non-contact mode, at a distance of 1 cm, using a setting of 0.1W as a continuous wave. The treated sites received 60 s of exposure, with an energy density (calculated as power/ areax time) of 3 J/cm  [Figure 5]. The laser treatment was carried out with adequate eye protection for the patient, operator and the assistant. Both the patients were asked to assess the pain on second, fourth and tenth day using a Numerical Rating Scale. The NRS for pain ranged from 0 (no pain) to 10 (severe pain). This was done for both the patients on the fourth and the ninth day to assess the revascularization of the grafted area. The color Doppler ultrasound imaging was performed with an ACUSON X300 TM (Seimens GE, Mountain View, CA, USA) ultrasound system, with 4D transducer technology. The probe used was a linear transducer probe (VF10-5) with 10 MHZ capacity [Figure 6]. 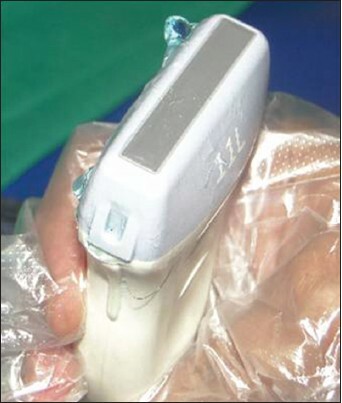 The transducer was applied over the glove finger in a coronal plane with interspersed ultrasonic gel for proper contact [Figure 7]. The water filled glove finger served as a water media for sound waves to pass, thus providing better clarity and detail. Neovascularization was noted in both the patients on the fourth and the tenth day [Figure 8] and [Figure 9], however, in case 2, marked increase in vascularity when compared to case 1 was seen on the fourth as well as the tenth day [Figure 10] and [Figure 11]. On comparison of the pain assessment, case 2 had reduced pain on day two, four, and compared to case 1, but drastic reduction in the laser treated case was seen on day four, with no change on the tenth day [Table 1]. Low-level laser therapy in clinical practice has been investigated and employed for about 30 years and have shown to be beneficial. LLLT uses low-powered laser light at wavelengths from 632-1064 nm, to stimulate a biological response [Table 2]. 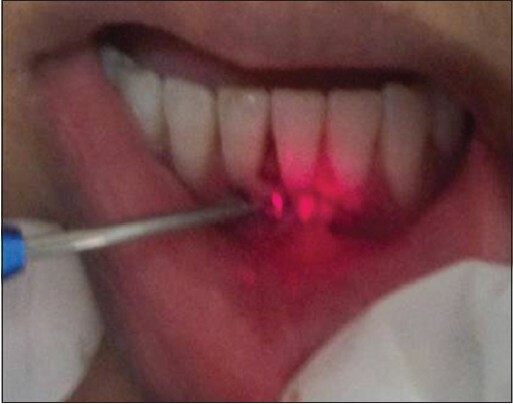 Low level laser therapy has varied applications in dentistry, and in the field of periodontics, has been tried as an adjunct in the non-surgical treatment of chronic periodontitis. 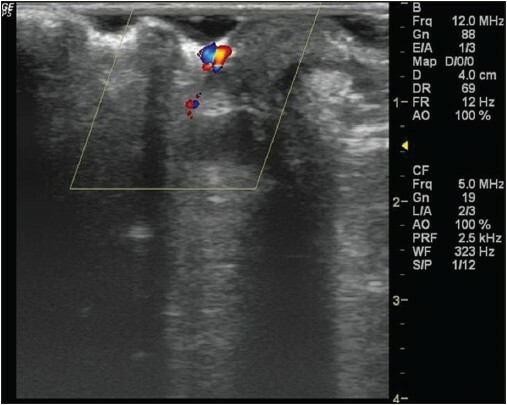 It has also been studied in gingival healing after gingivectomy,  but to our knowledge, this is the first study to have explored the effects of LLLT on healing following FGG procedure, in terms of revascularization with the help of ultrasound Doppler flowmetry. In most of the studies the method used to study the blood flow is laser Doppler flowmetry. 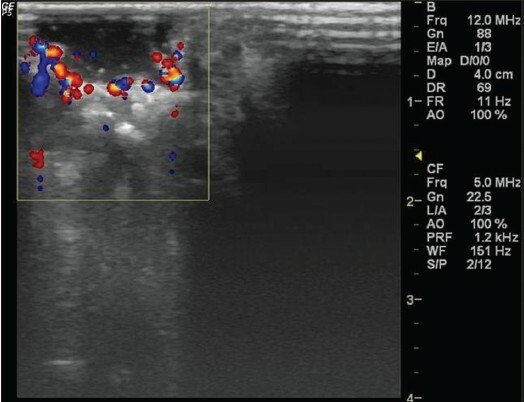 Pulpal blood flow measurements, perfusion following flap surgery, in gingival health and inflammation have been studied with laser Doppler flowmetry, but we used Doppler sonography because of the added advantage; comparison of blood flow changes between different sites in the same patient and different patients are possible. Moreover, Doppler sonography has not been tried, especially in periodontal plastic surgery, following the application of soft laser therapy. It is a well known fact that the initial and revascularization phase are critical during the early healing of FGG (Nobuto et al. 1985). In the initial phase, the graft receives nutrition from the connective tissue bed surrounding the recession, and in revascularization phase (after 4-5 days) anastomosis are established between blood vessels of the recipient bed and those in graft tissue, and is characterized by capillary proliferation. The results of the current study showed that revascularization is increased on day 4 and day 10 in patient treated with LLLT, compared to the other patient who did not receive LLLT. One of the prominent effects of LLLT during wound healing is stimulation of microcirculation. It causes vasodilatation, increasing local blood flow. It also causes relaxation of smooth muscle associated with endothelium. This vasodilatation brings in oxygen and also allow for greater traffic of immune cells in to the tissue, contributing to accelerated healing. Many studies have shown that the intracellular metabolic changes resulting from biostimulation promoted by low power laser have resulted in accelerated cell division, especially of fibroblasts and epithelial and endothelial cells, , thus accounting for the improved circulation seen in our study. The observed effect depends on a number of factors; power of the unit, wavelength used, distance from source to tissue, irradiation dose, exposure time, intensity, and method and number of irradiations. 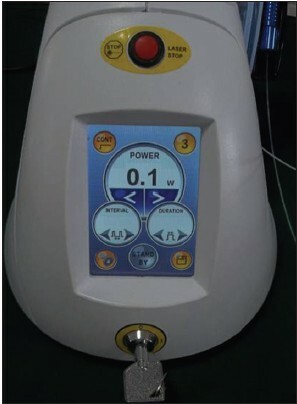 In this study, the selected parameters (power of 0.1W, dose of 3 J/cm 2 , exposure time of 60 sec fired in non-contact mode at a distance of 1 cm) on the day of surgery, third day, seventh day, and ninth day proved to be beneficial. LLLT can be considered as a valuable adjunct to aid early healing and pain control. However, longitudinal studies with a larger sample size and different laser settings are required to validate the use of LLLT following surgery. 1. Friedman N. Mucogingival surgery. Tex Dent J 1957;75:358. 2. Hashmi JT, Huang YY, Osmani BZ, Sharma SK, Naeser MA, Hamblin MR. Role of low level laser therapy in neurorehabilitation. PM R 2010;Suppl 2:S292-305. 3. Ihsan FR. Low-Level laser therapy accelerates collateral circulation and enhances microcirculation. Photomed Laser Surg 2005;23:289-94. 4. Sato T, Kawatani M, Takeshige C, Takeshige C, Matsumoto I. Ga-Al-As laser irradiation inhibits neuronal activity associated with inflammation. Acupunct Electrother Res 1994;19:141-51. 5. Karu TI. Molecular mechanism of the therapeutic effect of low-intensity laser irradiation. Dokl Akad Nauk SSSR 1986;291:1245-9. 6. Miller PD Jr. Root coverage using the free soft tissue autograft following citric acid application. III. A successful and predictable procedure in areas of deep-wide recession. Int J Periodontics Restorative Dent 1985;5:14-37. 7. Qadri T, Miranda L, Tunér J, Gustafsson A. The short-term effects of low-level lasers as adjunct therapy in the treatment of periodontal inflammation. J Clin Periodontol 2005;32:714-9. 8. 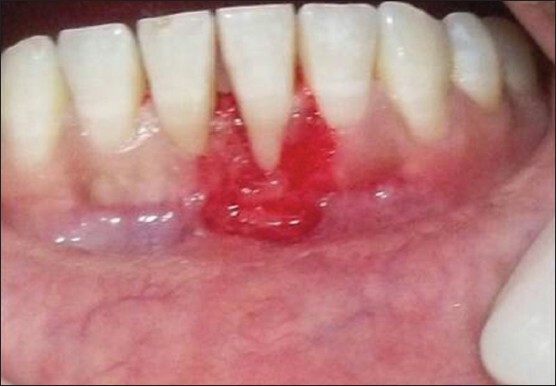 Amorim JC, de Sousa GR, de Barros Silveira L, Prates RA, Pinotti M, Ribeiro MS. Clinical study of the gingiva healing after gingivectomy and low-level laser therapy. Photomed Laser Surg 2006;24:588-94. 9. Nobuto T, Imai H, Yamaoka A. Microvascularization of the free gingival autograft. J Periodontol 1988;59:639-46. 10. Walsh LJ. 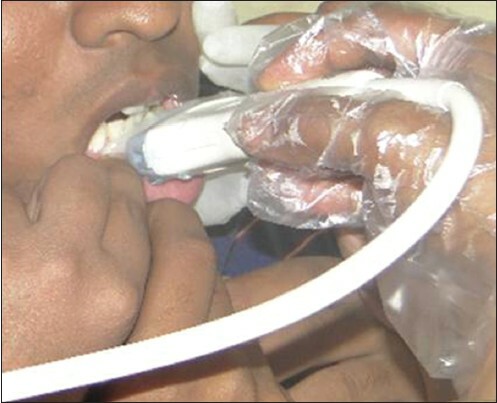 The current status of low level laser therapy in dentistry. Part 1. Soft tissue applications. Aust Dent J 1997;42:247-54. 11. Rocha Junior AM, Vieira BJ, Andrade LC, Monteiro A. Effects of low-level laser therapy on the progress of wound healing in humans: The contribution of in vitro and in vivo experimental studies. J Vasc Bras 2007;6:258-66. 12. Conlan MJ, Rapley JW, Cobb CM. Biostimulation of wound healing by low-energy laser irradiation. J Clin Periodontol 1996;23:492-6. 13. Camelo FP. Avaliacao clinica do efeito da irradiacao pos-operatoria do laser de baixa intensidade na cicatrizacao de gengivoplastias em humanos [Dissertacao]. Natal: Universidade Federal do Rio Grande do Norte; 2007. 14. Rocha Jr AM, Oliveira RG, Farias RE, Andrade LC, Aarestrup FM. Modulação da proliferação fibroblástica e da resposta inflamatória pela terapia a laser de baixa intensidade no processo de reparo tecidual. An Bras Dermatol 2006;81:150-6. 15. Saygun I, Karacay S, Serdar M, Ural AU, Sencimen M, Kurtis B. 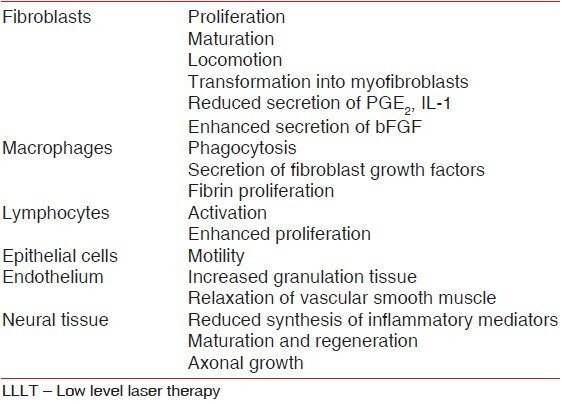 Effects of laser irradiation on the release of basic fibroblast growth factor (bFGF), insulin like growth factor-1 (IGF-1), and receptor of IGF-1 (IGFBP3) from gingival fibroblasts. Lasers Med Sci 2008;23:211-5. 16. Kreisler M, Christoffers AB, Willershausen B, d'hoedt B. Effect of low-level GaAlAs laser irradiation on the proliferation rate of human periodontal ligament fibroblasts: An in vitro study. J Clin Periodontol 2003;30:353-8. 17. Tsuchiya K, Kawata`ni M, Takeshige C, Matsumoto I. Laser irradiation abates neuronal responses to nociceptive stimulation of rat paw skin. Brain Res Bull 1994;34:369-74.